Our product range includes a wide range of stainless steel wire rope, stainless steel wire rope 304 grade, stainless steel wire rope 316 grade, industrial wire rope, stainless steel 304 grade rope wire and stainless steel 316 grade rope wire. We are recognized in the industry for offering a qualitative assortment of Stainless Steel Wire Rope. The given steel wire rope is precisely manufactured under the direction of experts utilizing top quality stainless steel in adherence with the specified standard of industry. This steel wire rope is provided in several specifications in order to meet the customer’s demand. Our steel wire rope is high on demand among customers due to its smooth finish. 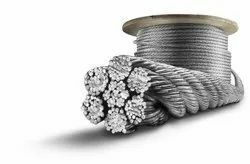 We are prominent dealers in Stainless Steel Wire Ropes - SS 304 and higher grades too - with properties of high fatigue strength and corrosion resistant. The ropes are tested on multiples parameters to suit the critical requirements of chemical resistance and dimensional accuracy of modern infrastructural needs. We are recognized in the industry for offering a qualitative assortment of Stainless Steel Wire Rope 316 Grade. The given steel wire rope is precisely manufactured under the direction of experts utilizing top quality stainless steel in adherence with the specified standard of industry. This steel wire rope is provided in several specifications in order to meet the customer’s demand. Our steel wire rope is high on demand among customers due to its smooth finish. 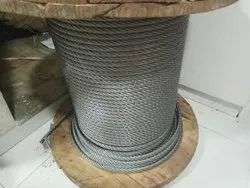 In stricter senses the term "wire rope" refers to diameter larger with smaller gauges designated cable or cords.Initially wrought iron wires were used, but today steel is the main material used for wire ropes. We have gained a immense expertise in manufacturing, supplying and exporting 304 Stainless Steel Rope Wire. Paying optimum attention to the demands of our clients, we manufacture this product with high-grade stainless steel. Offered product is acclaimed by the clients for its excellent tensile strength, corrosion resistance, longer service life and fine finish. We are reckoned names in the industry, offering varied range of SS Wire 316 that are sourced from certified vendors in the industry. They are quality approved and are corrosion resistant in nature. We offer them in varied thickness and dimensions and are abrasion resistant in nature. Our entire product range is flexible in nature and is delivered in varied specifications. We are prominent manufactures and suppliers and suppliers of these Wire Ropes which find their applications in various industries. These wire Ropes are demanded for their high tensile strengh, durabiliity and their ability to withstand high loads. These SS 316 Wire Ropes are also stretch proof and do not corrode due to the effect of weathering and moisture. Packaging Details: wooden box, goni packing, as per demand. The given steel wire rope is precisely manufactured under the direction of experts utilizing top quality stainless steel in adherence with the specified standard of industry. This steel wire rope is provided in several specifications in order to meet the customer’s demand. Our steel wire rope is high on demand among customers due to its smooth finish. Adikalp steeel oversess is a leading manufacturer for Steel Wire Ropes and Wire Rope Slings in India. We manufacture a wide range of sizes and constructions. We also provide tailor made solution as per customer’s requirement. We are pioneers in the manufacturing of Stainless Steel Wire Rope. We are manufacturer in SS 304 WIRE ROPE. Our qualitative and extremely durable steel rope are used in fiting cranes, tackles, machines, etc. High quality stainless steel is used as material for production of our wires. These ss 304 wire ropes available in the varied lenghts and diameters as requested by the client. Adikalp steel oversess is manufacturer of stainless stell 316 wire rope. We are prominent manufacturers and suppliers of these wire ropes which find their applications in various industries. these wire ropes are demanded for their high tensile durability and their ability to withstand high loads. these SS 316 wire ropes are also stretch proof and do not corrode due to the effect of weathering and moisture. 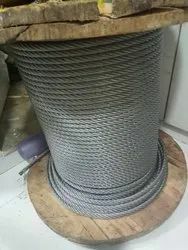 Adikalp steel oversess manufactures Stainless Steel Wires for Rope Industry. The wire is tailor made to suit the critical requirements of Rope Industry. We are one of the reckoned manufacturers and suppliers of quality Stainless Steel Wire Ropes 304l and 316l grade in the industry. These premium quality products are fabricated employing finest grade raw material and sophisticated machinery. 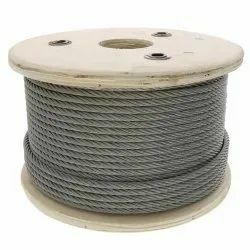 Extensively demanded for a myriad of industrial applications, these stainless steel wire ropes can be availed by clients at nominal market prices. 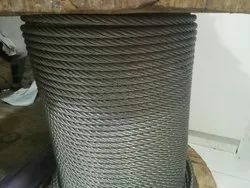 we are manufacture in stainless steel wire rope. we are provide you standard quality materil my clint. stainless steel wire rope is available in 304 and 316 grade. we are supply my material all india as well as all over country. 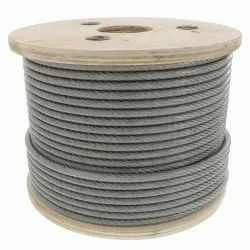 We are offering a quality range of Stanless Steel Wire Ropes 304 and 316 grade to our clients as per their requirement. Our clients can avail a quality range of our product at market leading prices. Packaging Details: gone packing, wooden box, as per Clint requirement. Adi kalp steel overseas is manufacturing and supplying of stainless steel wire rope 310 grade. this product is very standard and quality product. this material is steel core and indian make. this product capacity is very standard and hevy. 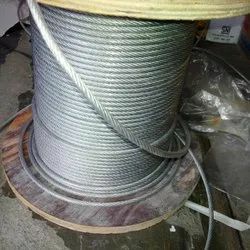 stainless steel wire rope is very popular product in this indian market.